Holiday Celebrations are underway and we wanted to celebrate by introducing to you our Andes Mint Back Facial. This Facial is an exclusive offer that will only be around the month of December, so don’t wait to book! It is available at all locations! 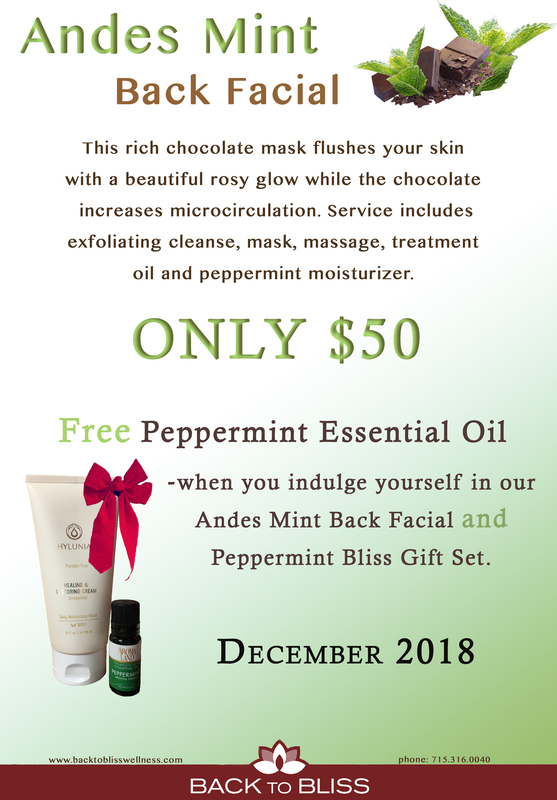 When you book our Andes Mint Back Facial you will indulge in this chocolate goodness with a hint of mint to awaken your senses and acquire all the benefits that this back facial has to offer. The rich chocolate mask flushes your skin with a beautiful rosy glow while the chocolate increases microcirculation. What are Back Facials and Why would I want to get one? To Answer those Questions we pulled some tidbits from one of Victoria’s blogs called Back Facials ARE a thing you can read this full article below! Back facials are for anyone who is looking to keep healthy looking skin, but here is a list of people they would be very beneficial for. What does a back facial consist of? Back facials are very similar to face facials in the way that they follow a very similar protocol. This service also includes extractions (if needed), a steamer to help open the pores and make the service even more relaxing; and a scalp, neck, and arm massage. 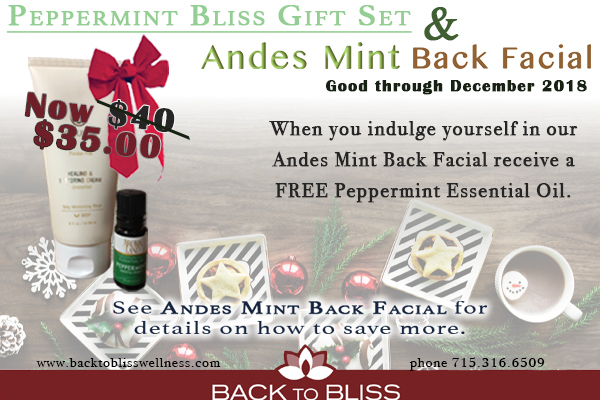 When purchasing the Andes Mint Back Facial make sure to grab your Peppermint Bliss Gift Set to receive a Peppermint Oil for Free. You can also purchase the Peppermint Bliss Gift Set separately for a low price of $35. Improves the texture of oily or greasy skin. Helps to heal very dry, cracked, scaly skin. Good for all areas of the body. Back Facials ARE a thing! Western medicine dissects, differentiates, and separates illness into more and more finite detail. While there is amazing good that comes from this, it forces us to specialize and master all those details in order to be helpful. 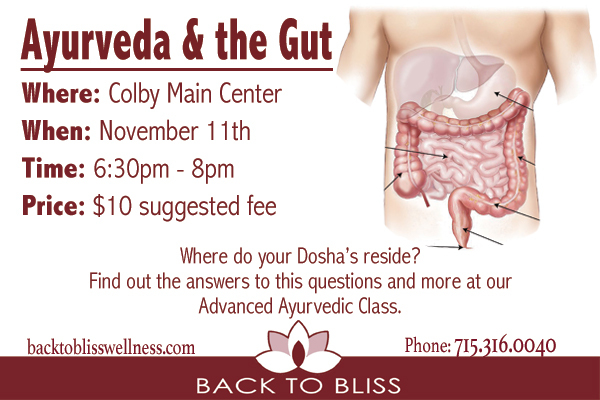 Ayurveda seeks to find the same answers to health via the core vibrational essences. This perspective is completely opposite in that it looks for primary or foundational unbalances that are the root causes instead of focusing on all the branching details at the leaf. This opposing perspective does many good things, but for our purposes the most important is that it makes health accessible to our understanding. By understanding primary root energies and focusing on ways to keep those few things in balance we can take back control of our health. We are offering day long immersion classes in ayurveda as well as an Advanced Topics single night class this fall at both the CBY (Colby) and WAU (Wausau) locations. If the idea of learning a completely different health philosophy or more about the mind/body/spirit connection then make some time to join us. 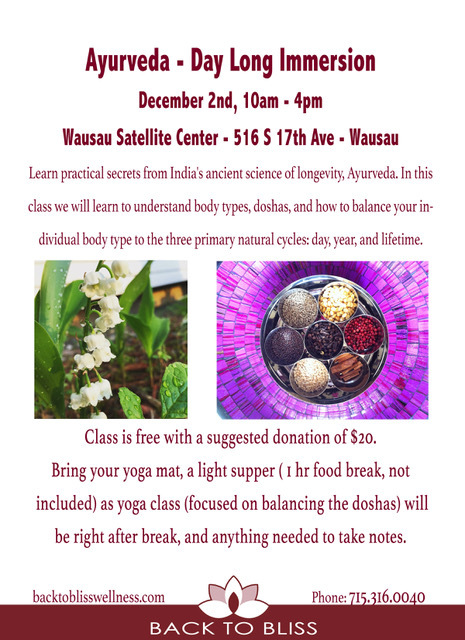 This class is very informative and packed full with ideas that will change the way you think and live. The ancients considered undigested matter to be the basic material that, after it builds up in the body, disrupts normal processes and accelerates the disease process. The ancients used fire as a metaphor to encapsulate lots of healthy eating wisdom. As we move into the holiday season, try using the metaphor of fire to aid you in making food choices. A few gentle adjustments to our eating habits over the next two months can lead to fewer bouts of indigestion. To keep our fire healthy, we should eat in such a way that we burn (digest) all our food with as minimal ash (bathroom waste) left over as possible. Then, we want to dispose of the ash as fast as possible so it doesn’t accelerate the disease process. We do this by keeping our fire pit (stomach) clean, choosing cleaner wood (food) to burn, and tending to the flame (acids and enzymes) so that it stays at a consistent burn. This last bit happens in the short term, meal per meal, and over the long term as we nurture digestive system function and vitality. While the advice encapsulated in the metaphor of fire can fill a whole weekend seminar, here are two gems to think about that help us avoid creating a smokey digestive fire this holiday season. 1: The stomach is a single pot. – Think of cooking rice. What would happen if you added a second serving of rice to the pot about half way through cooking? If you were to serve the rice when the first half finished cooking, you would have a whole bunch of crunchy rice ruining the meal. If you were to keep cooking until everything finished cooking, half of the pot would be pure mush. It means we should fully digest each meal before we eat again. The stomach empties fully in four hours, so hold off on snacks for a while after your meals to decrease indigestion. 2: Water puts out fire. – Water douses a flame, and the same is true for your digestive fire. Stomach acids and digestive enzymes work better in stronger concentration and with elevated temperature. By diluting your digestive chemicals you slow down the speed and effectiveness of your digestive fire. The result is a poorer performing digestive process that results in increased indigestion. Basically the advice is to drink fewer liquids with meals, and when possible switch the liquids you drink closest to meals from cold to hot beverages. Remember: Eating poorly over the holidays is a tradition! Enjoy the special moments and times with loved ones fully. Do what you can to keep your digestion happy and your heart. Caution: Feast day meals are not the real problem, no matter how bloated and rough you may feel from your indulgences. The long term habits that dim our digestive flame are the ones that lead to the deepest problems down the road. Take a moment and meditate. Stop and do it right now before reading on. What happened? Did you know what to do? Even if you haven’t done it before, I bet an image came into your mind. Maybe you even adopted the posture you’ve seen in pictures. We’ve all seen that meditating frog somewhere. He sits with legs crossed and with middle finger and thumb touching, eyes closed. Maybe you sang out, “OOOOOMMMMM.” But what happened? Did you really meditate? Just because you copied the picture did you get the result? The sneaky trait of wellness that I want to point out today is that wellness doesn’t actively hide from us. It’s just that we have trained ourselves to focus on traits wellness often lacks. We can point to our cultural biases towards youth and activity, the pace and saturation of media input, and our own desires for stimulation and approval. We have adopted habits that rush us headlong towards shiny things, instead of the plain-Jane. This is where we miss opportunities for wellness. Wellness is often simple, lacking that stimulating “shininess” that keeps us engaged. Please pay attention when you get caught up in the glitz and glamour of the newest fad. Is the quick fix product over-promising a cure? Living in America provides amazing opportunities to be healthy and happy, but we need to remember that our culture and our media have their own agendas. Those agendas are not necessarily your health and happiness. Caution: Bigger, Sexier, Shinier, Younger, and Newer are not always best when it comes to wellness. Remember: Wellness is not an image. The meditating frog can’t teach us to actually meditate. What’s more, our cultural assumptions about the image and the way it’s delivered make an impression that guides our actions. If these impressions are guiding us away from wellness, then they are a barrier. Does that meditating frog create disdain for meditation? Experiment: Grab a watch or clock. Walk into the next room and for thirty seconds mentally catalog everything in that room that is the color red. Don’t write anything down, it’s an experiment. Read on after you come back. Experiment Results: Give yourself one point for everything in the room that you can remember. But only for things that were blue. Tricky, I know. Wellness sneaks by us in just this way. Having worked in the wellness industry for 13 years, I have come to understand that wellness is in fact quite sneaky. It sneaks up on us without our awareness. Wellness also sneaks away of its own accord. We simply don’t know how to grasp it and where to look for it. That fact alone is a barrier to us staying well. If we knew what truly helped us stay well, I imagine we would do a little more of it. The image I have is of Elmer Fudd sincerely looking at me, whispering loudly, “ Be verwy verwy quiet. We’re hunting wellness.” Like our dear friend Elmer we are just a bit off the mark when it comes to efficiently hunting our goal. Through the years I have found three major ways in which wellness sneaks by us unknowingly. We’ll start with subtlety. When you eat a habanero pepper, you know it. Your watering eyes, red face, and immediate unrelenting desire for a drink all tell you, “Yep, I ate a pepper.” If things that increased our vitality and equilibrium gave us such easy to read cues, we’d know what they were. They would be obvious and thus much more easily accessible. However, beneficial actions, foods, and herbs often build up our strength gently over time. They are like a bank account slowly and steadily accumulating interest. When we fail to notice their positive benefits for us, then we are much more likely to let them go as a part of our wellness routine. We miss their potential and often falsely flag them as unhelpful and only return to them reluctantly, if ever. An herb, say turmeric, will often sneak into our lives for half a bottle of tablets or so and then out again without us truly knowing what it was doing for us. We failed to pay attention to the subtle signs and gentle benefits we were receiving and thus allowed the herb to fall away from our practice. A great example comes from yoga. New students often fail to grasp the deep benefits they have been receiving and thus decide to drop out after a series or two. Very often I will get a call from these same students asking to sign back up three weeks later. (Three weeks without yoga is enough time for all of their pains and fatigue to come rushing back.) That’s when they notice. It is only then, when they were feeling well and lost it quickly, that the change is large enough for people to really feel the wellness benefits they were receiving. Now they know yoga was good for them. It took a strong cue to grasp it. Experiment: Try something for three weeks, and then stop cold turkey as in the yoga example to get a stronger cue. You can feel the changes best only after you’ve been doing something consistently and then suddenly stop. Discomfort is a stronger cue then health. Remember: Look for subtle cues of increased health such as less pain and less fatigue. Caution: Quick and bold fixes sound great, but true wellness often sneaks in quiet, gentle, and slow ways. Muscles are wonderful things. They tend to us in many ways. They scratch our backs. They let us move mountains and give each other hugs. Have you ever thought about what you can do for your muscles? There are five simple things that your muscles need every day. Keep these five things in mind so you can create more balance in your fitness routines as well as your lifestyle in general. They are: stretch, squeeze, sweat, fuel, and rest.